WF Fall Session, originally uploaded by Women First Swimming. 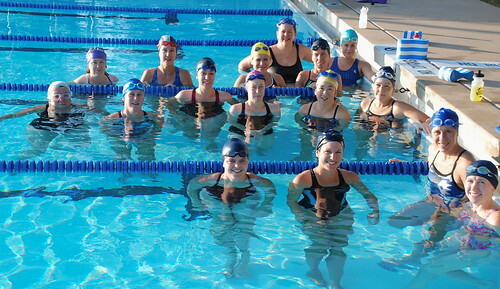 Photos taken on September 29, 2007 at a Women First Swimming Saturday morning practice. Check out this week’s latest workout on your own here, and give it a try! A little bit of GOLF! Don’t forget to share your comments (and GOLF scores!) from workouts during the week to encourage other mermaidss and to earn your attendance points. Check out the latest mermaid interview with Kris Sorenson-Hyatt. Keep enjoying your Saturday swims! Remember to add your comments to the web page to earn your attendance points. I hope everyone has been enjoying the Saturday classes. If you missed class, or are practicing during the week, you might like to try one of the posted “Weekly workouts” (which if you haven’t noticed has been more like a quarterly posted workout from me!) or access the Saturday Workouts page (soon to be updated) with your password. I will be attempting to post more frequent workouts for “on your own sessions” but tailored to the level of the class. Feedback welcomed on what kind of workouts are more helpful than others. For September we have a session for the pool and an open water workout that was used for USMS Swimmer Magazine May issue. Please provide comments or stories about your workout adventures. Comments can be used for “attendance points.” See more in class email for details on attendance award.